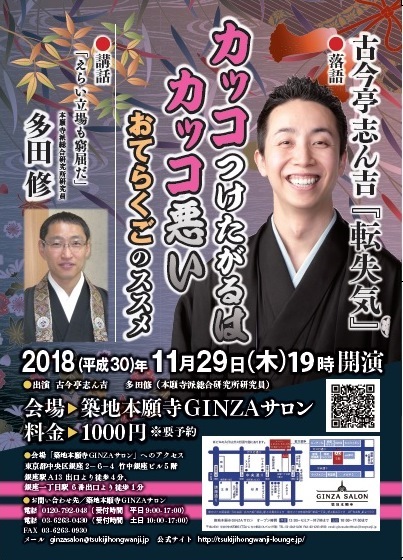 On November 29, "OTERAKUGO NO SUSUME" , an event to like Buddhism through rakugo will be held at the Tsukiji Hongwanji Ginza Salon. It will start at 7:00 p.m.
First, Mr. KOKONTEI Shinkichi will perform a rakugo "Tenshiki" (What is Tenshiki ? If you want to know it, please listen to the rakugo). Next, I will talk about mind to want to decorate ourselves. You can make the reservations by telephone (0120-792-048), E-mail ( ginzasalom@tsukijihogwanji.jp ) or the web site of the Tsukiji Hongwanji Ginza Salon.